University of California Press, 9780520272941, 352pp. In private life, we try to induce or suppress love, envy, and anger through deep acting or "emotion work," just as we manage our outer expressions of feeling through surface acting. In trying to bridge a gap between what we feel and what we "ought" to feel, we take guidance from "feeling rules" about what is owing to others in a given situation. Based on our private mutual understandings of feeling rules, we make a "gift exchange" of acts of emotion management. We bow to each other not simply from the waist, but from the heart. 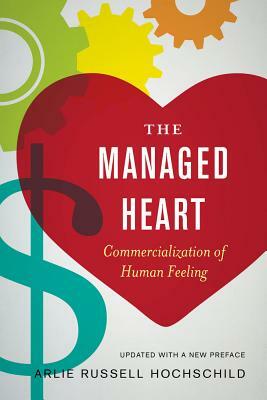 But what occurs when emotion work, feeling rules, and the gift of exchange are introduced into the public world of work? In search of the answer, Arlie Russell Hochschild closely examines two groups of public-contact workers: flight attendants and bill collectors. The flight attendant’s job is to deliver a service and create further demand for it, to enhance the status of the customer and be "nicer than natural." The bill collector’s job is to collect on the service, and if necessary, to deflate the status of the customer by being "nastier than natural." Between these extremes, roughly one-third of American men and one-half of American women hold jobs that call for substantial emotional labor. In many of these jobs, they are trained to accept feeling rules and techniques of emotion management that serve the company’s commercial purpose. Just as we have seldom recognized or understood emotional labor, we have not appreciated its cost to those who do it for a living. Like a physical laborer who becomes estranged from what he or she makes, an emotional laborer, such as a flight attendant, can become estranged not only from her own expressions of feeling (her smile is not "her" smile), but also from what she actually feels (her managed friendliness). This estrangement, though a valuable defense against stress, is also an important occupational hazard, because it is through our feelings that we are connected with those around us. On the basis of this book, Hochschild was featured in Key Sociological Thinkers, edited by Rob Stones. This book was also the winner of the Charles Cooley Award in 1983, awarded by the American Sociological Association and received an honorable mention for the C. Wright Mills Award.